Punjab and Haryana High Court on Wednesday ruled that in the absence of any such law or valid regulation, a Sikh cannot be restrained from wearing and carrying a Kirpan in Court. “The petitioner being an Amritdhari Sikh is enjoined by his religion to, at all times, wear the five kakars, of which Kirpan is one. The Constitution explicitly and in the plainest terms secures to the petitioner the right to wear and carry Kirpan as being included in the profession of his religion. This right could only be subject to regulation in the interest of public order, morality or health, which regulation could be only by the mandate of a statute. Hence, in the absence of any law or valid regulation prohibiting the carrying of a Kirpan in a Court room, the petitioner could not be restrained from wearing and carrying a Kirpan in the Courtroom,” Justice Harinder Singh Sidhu observed. The Court was hearing a petition filed by Mr. Dilawar Singh, who is a prosecution witness in a murder trial being conducted before the Sessions Judge, Ambala. Before he could give his statement before the Court, Mr. Singh was directed to remove the Kripan, which he was carrying on account of him being an Amritdhari Sikh. He however refused to do so on the plea of it forming a part of his religious freedom. He then approached the High Court contending that the Court’s request violates his Fundamental Right to profess and practice his religion. In the written statement filed on behalf of the State of Haryana, it was contended that Kirpan should be considered as a religious symbol relating to Sikh religion and that there should be no restriction on wearing Kirpan by Sikhs while appearing in Court. They referred to several such cases in the U.K. and the U.S., where the carrying of Kirpan has been recognized as a manifestation of the Sikh faith. Examining the question involved, the Court looked into various texts which emphasize the importance of a Kirpan for an Amritdhari Sikh, and also delved into the struggle that the Sikhs had to face for their right to carry Kirpan during the British reign. During this period, the keeping and carrying of Kirpans was denied under the Indian Arms Act, 1878, and the ensuing struggle had assumed the shape of a non-violent Kirpan morcha. The Court noted that it was only in 1922, that a compromise was arrived at between the Punjab Governor and the Shiromani Gurdwara Parbandhak Committee. 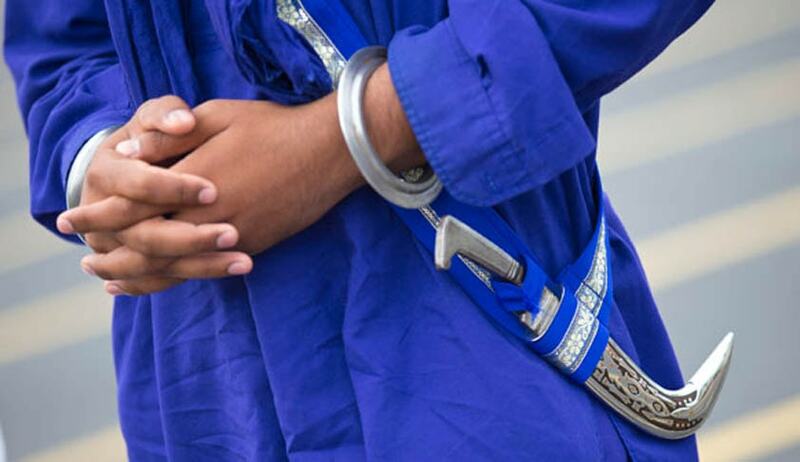 Accordingly, an announcement was made on behalf of the Punjab government that the Sikhs would not be prosecuted for wearing, keeping and carrying the Kirpan.